The MultiPhones Guest Pod II is a compact stereo headphone amplifier for broadcast studios and other professional sound installations. The Guest Pod II can be used with a MultiPhones Master unit or by itself as a stand-alone headphone listening station. In either case, multiple Guest Pods can be linked using cat5 cabling to produce a multi-user headphone listening system. 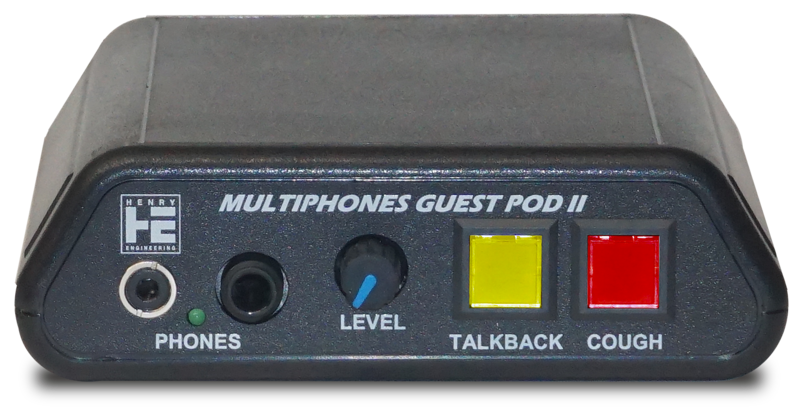 The front panel of the Guest Pod II includes a volume control, both 1/4” and 3.5mm headphone jacks, and two user-assignable illuminated pushbuttons. These buttons are typically used for talent Cough (mic mute) and Talkback functions. When Guest Pods are used with a MultiPhones Master unit, audio and power are supplied by the Master. Each Guest Pod has two RJ45 I/O jacks so that multiple units can be “daisy chained” together. Up to 12 Guest Pods can be supported by one MultiPhones Master unit. For stand-alone use, stereo audio is fed to the two 1⁄4” Input jacks, and a 9-12 volt AC power source is connected to the Power jack. 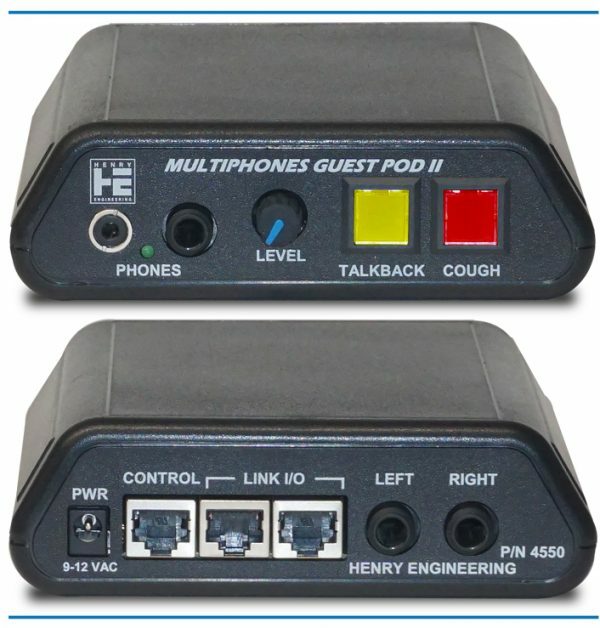 Multiple Guest Pods can be “daisy chained” together using cat5 cabling so that audio and power are distributed to all units. 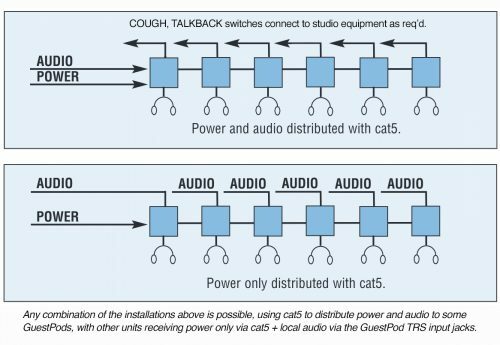 Another installation option is to use cat5 cabling to distribute power (only) and feed a separate audio signal to each Guest Pod. The Cough and Talkback buttons provide SPDT contacts with LED illumination, and can be user-wired to any pinout required via the Control RJ45 connector. The MultiPhones Guest Pod II is optimized for use with contemporary high- efficiency headphones. Because each Guest Pod contains its own amplifier, any combination of different headphones can be used. There is no interaction between units, and no degradation of audio performance regardless of the number of Guest Pods in the system. The cat5 linking uses low-Z balanced audio distribution so that long cable runs do not degrade audio quality. The Guest Pod II is compact for convenient mounting on a desktop or attached to the underside of a counter. An optional Mounting Plate allows the unit to be mounted into cabinetry. A 12 volt AC power supply is optional.